ZFC Item Print Page - General Custer's Headquarters Command Guidon. Comment: In 1864, when General Sheridan came East with General Grant and assumed command of the Cavalry Corps of the Army of the Potomac, he instituted a special headquarters flag for the commanders of each of his three cavalry divisions. The flag emulated the pre-War cavalry guidon in that it was swallow-tailed in form and divided horizontally, red over white. On each of the two horizontal bars, the respective division number was applied in the color of the opposite bar. The 3rd Cavalry Division of Sheridan's Cavalry Corps was initially commanded by Brigadier-General James Wilson. 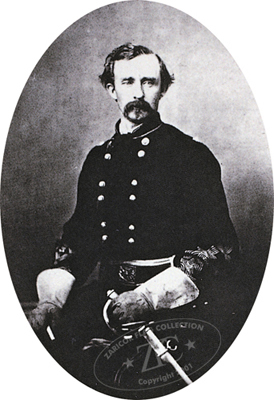 In September of 1864, however, Wilson was transferred to the western theater to command his own Cavalry Corps. Brigadier-General George A. Custer then assumed command of the 3rd Cavalry Division and commanded it until the close of the War. Custer's orderlies carried this flag along with his own personally designed flag with Custer in the campaigns that followed, until the 3rd Division flag became too worn for further use. Provenance: Acquired by the Zaricor Flag Collection (ZFC0490) in 1995 from the descendants of G. A. Custer, through Butterfield & Butterfield Auction House of San Francisco, CA. Comment: In 1864 when General Sheridan came East with General Grant and assumed command of the Cavalry Corps of the Army of the Potomac, he instituted a special headquarters flag for the commanders of each of his three cavalry divisions. The flag imitated the pre-War cavalry guidon in that it was swallowtailed in form and divided horizontally, red over white. On each of the two horizontal bars, the respective division number was applied in the color of the opposite bar. 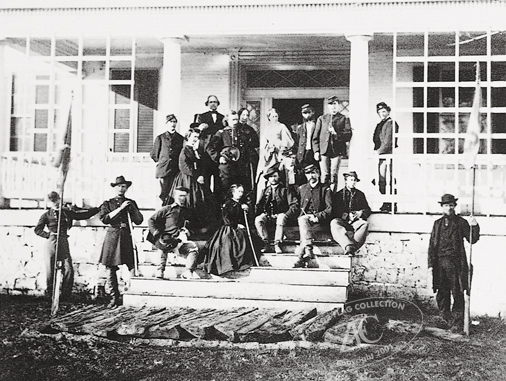 The 3rd Cavalry Division of Sheridan's Cavalry Corps was initially commanded by Brigadier-General James Wilson. In September 1864, however, Wilson was transferred to the western theater to command his own cavalry corps. Brigadier-General George A. Custer then assumed command of the 3rd Cavalry Division and commanded it until the close of the War. Custer-or rather his orderlies-carried this flag along with his own personally designed flag in the campaigns that followed, until the 3rd Division flag became too worn for further use. Provenance: Acquired by the Zaricor Flag Collection (ZFC0490) in 1995 from the descendants of G. A. Custer, through Butterfield & Butterfield Auction House of San Francisco, CA. The exhibition text was written by Howard Michael Madaus, Exhibition Director of the ZFC's Flag Center, utilizing Zaricor Flag Collection archives. Media: Wool bunting and cotton; hand-sewn. retired, souvenirs were taken by Custer's staff. Publication Copy Madaus, Howard M., Dr, Whitney Smith, The American Flag: Two Centuries of Concord and Conflict. Santa Cruz: VZ Publications, 2006, p. 85.
was transferred to the western theater to command his own cavalry corps. Brigadier-General George A. Custer then commanded the 3rd Cavalry Division until the close of the War. Custer (or rather his orderlies; see photo) carried this flag along with his own personally designed flag in the campaigns that followed, until the 3rd Division flag became too worn out in the last week of the war. Provenance: Acquired by the Zaricor Flag Collection in 1995 from the descendants of G. A. Custer, through Butterfield & Butterfield Auction House of San Francisco, CA.